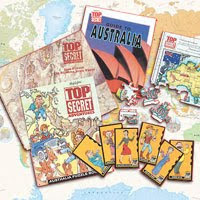 Start your child's puzzle adventures today with our special FREE Top Secret Adventures kit offer! Begin a learning adventure today—your first Top Secret Adventures kit is FREE! All you pay is $3.45 for shipping and handling. I think we got a free sample of this. I'm tempted to get it for the kids. It looks good. That is awesome! It is too old for DS or I would be all over it. I loved Highlights when I was a kid!